A little boy rolling the prayer wheels at Swayambhunath, Nepal. A prayer wheel is a cylindrical wheel (Tibetan: འཁོར་, Wylie: 'khor ) on a spindle made from metal, wood, stone, leather or coarse cotton. Traditionally, the mantra Om Mani Padme Hum is written in Sanskrit on the outside of the wheel. Also sometimes depicted are Dakinis, Protectors and very often the 8 auspicious symbols Ashtamangala. At the core of the cylinder is a "Life Tree" often made of wood or metal with certain mantras written on or wrapped around it. Many thousands (or in the case of larger prayer wheels, millions) of mantras are then wrapped around this life tree. The Mantra Om Mani Padme Hum is most commonly used, but other mantras may be used as well. According to the Tibetan Buddhist tradition based on the lineage texts regarding prayer wheels, spinning such a wheel will have much the same meritorious effect as orally reciting the prayers. According to the Tibetan tradition, the prayer wheel lineage traces back to the famous Indian master, Arya Nagarjuna. Tibetan texts also say that the practice was taught by the Indian Buddhist masters Tilopa and Naropa as well as the Tibetan masters Marpa and Milarepa. According to the lineage texts on prayer wheels, prayer wheels are used to accumulate wisdom and merit (good karma) and to purify negativities (bad karma). In Buddhism, Buddhas and Bodhisattvas have created a variety of skillful means (upaya) to help bring practitioners ever closer to realizing enlightenment. The idea of spinning mantras relates to numerous Tantric practices whereby the Tantric practitioner visualizes mantras revolving around the nadis and especially around the meridian chakras such as the heart and crown. Therefore, prayer wheels are a visual aid for developing one's capacity for these types of Tantric visualizations. 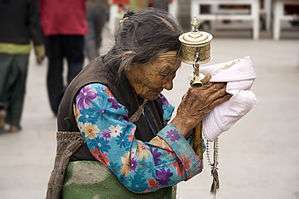 The spiritual method for those practicing with a prayer wheel is very specific (with slight variations according to different Buddhist sects). The practitioner most often spins the wheel clockwise, as the direction in which the mantras are written is that of the movement of the sun across the sky. On rare occasions, advanced Tantric practitioners such as Senge Dongma, the Lion-Faced Dakini, spin prayer wheels counterclockwise to manifest a more wrathful protective energy. As the practitioner turns the wheel, it is best to focus the mind and repeat the Om Mani Padme Hum mantra. Not only does this increase the merit earned by the wheel's use, but it is a mind-stabilization technique that trains the mind while the body is in motion. 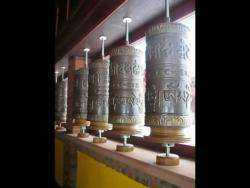 Intoning the mani mantra with mindfulness and the "Bodhicitta" motivation dramatically enhances the effects of the prayer wheel. However, it is said that even turning it while distracted has benefits and merits, and it is stated in the lineage text that even insects that cross a prayer wheel's shadow will get some benefit. Each revolution is as meritorious as reading the inscription aloud as many times as it is written on the scroll, and this means that the more Om Mani Padme Hum mantras that are inside a prayer wheel, the more powerful it is. It is best to turn the wheel with a gentle rhythm and not too fast or frantically. While turning smoothly, one keeps in mind the motivation and spirit of compassion and bodhichitta (the noble mind that aspires to full enlightenment for the benefit of all beings). The benefits attributed to the practice of turning the wheel are vast. Not only does it help wisdom, compassion and bodhichitta arise in the practitioner, it also enhances siddhis (spiritual powers such as clairvoyance, precognition, reading others thoughts, etc.). The practitioner can repeat the mantra as many times as possible during the turning of the wheel, stabilizing a calm, meditative mind. 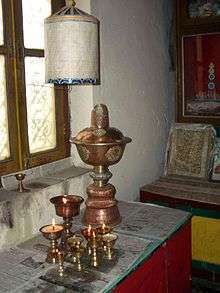 At the end of a practice session, there is a Tibetan Buddhist tradition of dedicating any accumulated merits that one may have gathered during practice to the benefit of all sentient beings. Then Om Ah Hum 3 times. This is customary with Tibetans upon completing any Buddhist practice, including the practice of the prayer wheel. Pilgrim with prayer wheel, Tsurphu Monastery, 1993. The mani wheel, or hand prayer wheel, has a cylindrical, generally sheet-metal body (often beautifully embossed) mounted on a metal shaft or pin set into a wooden or metal handle that turns on a circular bearing commonly made of Turbinella (conch) shell. The cylinder itself is affixed with a cord or chain terminating in a metal weight allowing it to be spun by a slight rotation of the wrist. The weighted chain, known as a “governor” in Western technology, stabilizes the wheel and keeps it spinning with less input from the practitioner than would otherwise be the case. The common term, “prayer wheel” is a double misnomer. A long strip of rolled-up paper bearing printed or inscribed mantras (Tib. mani) rather than prayers, per se, is inside the cylinder. “Mill,” defined as “a spinning object that generates something,” is a better translation of the Tibetan ‘khor-lo than is “wheel” since it is thought that the spinning cylinder emanates positive energy, allowing the practitioner to accumulate wisdom and merit. The Tibetan name of this device is mani-chos-'khor (མ་ནི་ཆོས་འཁོར་). Schlagintweit L.L.D., Emil (1863). Buddhism in Tibet. Augustus M. Kelley, 1969. Wright, A.R. (1904). Tibetan Prayer wheels. Folklore Enterprises. "All about the ... Prayer Wheel". khandro.net. "prayer wheels and how they work". Nyingma Centers. Ladner, Lorne (2000). Wheel of Great Compassion. Wisdom Publications. Prayer wheels at Samye Monastery. Girls Turning the prayer wheels at Swayambhunath Stupa, Kathmandu. Stupa & prayer wheels. Main street, McLeod Ganj. Prayer wheels at the base of the Potala in Lhasa, Tibet. A Prayer wheel at Dukezong Temple in Shangri-La County, Yunnan. A wooden prayer wheel by Galgamani Art Project, Aug. 2010. ↑ "Vairocana Buddha Prayer Wheel". Buddha Tooth Relic Temple and Museum. Retrieved 2013-03-31.